The chief executive of a new regional airline being set up says he has not given up hope of the Whenuapai military airbase being used for commercial flights. Kiwi Regional Airlines wants to fly from Whenuapai to Wellington, but Defence Minister, Gerry Brownlee said he had no plans to change the airbase's status. The carrier's CEO, Ewan Wilson, said he would keep trying to change the Government's mind. "It still remains a goal for us. Governments come and go, we're not quite sure of what makes Whenuapai so unique. The military base at Woodbourne, Blenheim operates for both civilian and military use." Mr Wilson said the start-up airline was still planning to apply for consent to fly routes abandoned by Air New Zealand, including between Auckland, Hamilton, Nelson and Queenstown, as-well-as between Tauranga, Palmerston North and Blenheim. 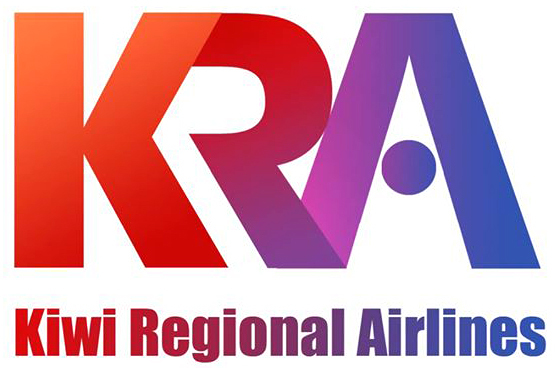 New player Kiwi Regional Airlines (KRA) has announced plans for regular passenger air services between a series of regional centres in both North and South Islands. The flights will commence towards the end of 2015 or at the start of 2016, initially with two aircraft, and later with a third; to be flown by SAAB 340 34-seater aircraft – a twin-engine, twin-pilot, pressurised aircraft. All flights will be subject to regulatory approval. The starting point of one route is 'North Shore' and will be flown from Whenuapai airbase, subject to RNZAF approval and other consent processes. The joint military-commercial use of RNZAF facilities is already well-established at Blenheim, and Whenuapai itself was such a joint facility for nearly 20 years until 1965. 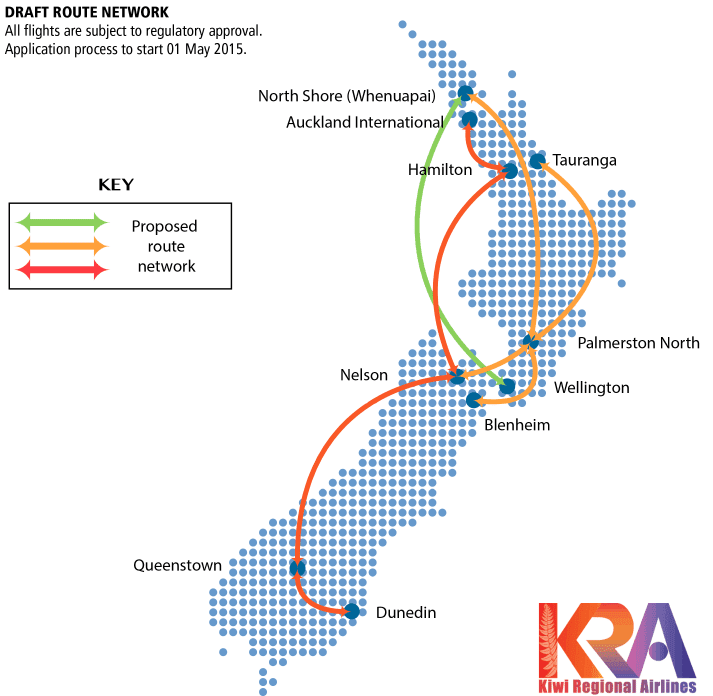 Three routes are planned initially (click here for route map), but KRA Chief Executive Ewan Wilson said "approaches from, and discussions with other regional centres show there is a greater demand, and we are actively considering other possibilities." Mr Wilson said he was "thrilled to be able to offer regional New Zealand important direct routes that have either not been flown before, or are being exited by the national carrier." "Our name says a lot – regional New Zealand has been left off the air route map unless you want to travel to the three largest centres. "We intend to complement existing offerings; to fill the gaps and to make travel between regional centres as fast and affordable as possible. "We will not be competing directly with the national carrier. "As well as improved opportunities for travellers, we expect our operations will create employment and tourism opportunities, and we are in consultation with relevant organisations in the different regions we will service about these opportunities," said Mr Wilson. KRA's corporate headquarters will be in Hamilton, where Mr Wilson is based. NZ's newest airline announces direct routes from regional centres to Auckland, Queenstown and Hamilton. 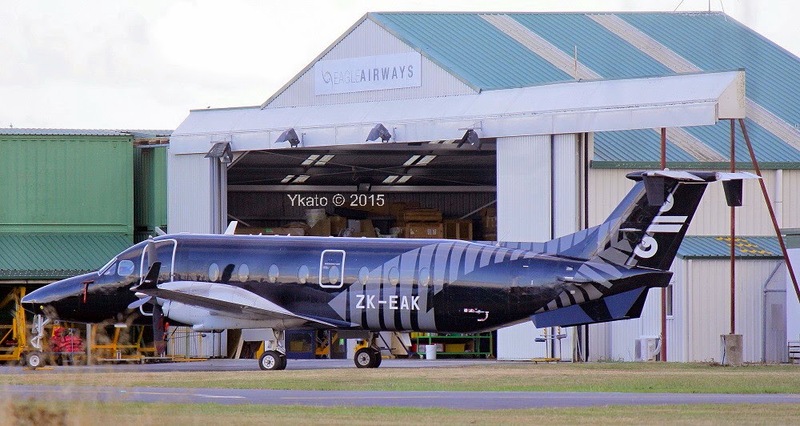 While it still needs to get certification, Kiwi Regional Airlines will aim to be in the sky by the end of the year, with direct flights between Auckland, Hamilton, Nelson, Blenheim and Palmerston North with a connection to Queenstown. The company will be based in Hamilton, and will purchase two Saab 340 34-seater aircraft from Europe for the flights. Snacks and refreshments will be offered, and the service will include a flight attendant.... Wilson said load factor and yield date from Air New Zealand had been provided to the company which had helped determine the routes, which were not being offered by any other carrier as far as he was aware. They include a flight from Auckland, stopping in Hamilton, Nelson, Queenstown to Dunedin, which will fly daily both ways. Flights from Palmerston North to Blenheim, Nelson, Tauranga and the North Shore will also be offered, along with one from the North Shore to Wellington. The direct flights from Blenheim and Palmerston North would run six days a week. Nelson would be served by a morning flight from Queenstown, going on to Hamilton and Auckland with a mid afternoon return. The flight would be part of a route left Dunedin in the early morning, arriving in Auckland around midday before returning on the same route. Another aircraft would provide Nelson-Tasman residents with direct connections to Palmerston North, and an ongoing connection to Tauranga. Wilson said the company had all the funds required to get its operating licence, hire staff, buy planes and set up headquarters in Hamilton thanks to shareholders. Investor 2 Cheap Cars, a used-car importer and retailer, and Nicole Domett, the chief executive of the Aviation and Travel Training Group, have joined Wilson as shareholders. Defence Minister Gerry Brownlee has clipped the wings of a fledgling regional airline before it can get off the ground, rejecting plans to operate domestic flights from Whenuapai airbase, northwest of Auckland, to Wellington. Kiwi Regional Airlines (KRA) chief executive Ewan Wilson has responded by accusing the Government of bias, questioning its role in who uses the military airbase given the government's major shareholding in competitor Air New Zealand. KRA is proposing domestic flights from the Whenuapai airbase to Wellington as investors look to capitalise on 450,000 residents who must drive up to an hour to Auckland Airport for domestic services. The airline yesterday released details of its intended routes, targeting some of the routes dumped by Air New Zealand late last year. But in 2009 Cabinet knocked back a proposal for commercial flights at Whenuapai following concerns from residents about noise. Last night a spokesman for Mr Brownlee confirmed the Government had no plans to revisit the decision and Whenuapai should remain operating as a military airbase only. Mr Wilson, the founder of the mid-1990s failed Kiwi Travel International Airlines, said he would not give up on the idea and would forge ahead with the airline and with trying to change the Cabinet stance. The airline, backed by Sir George Seymour National College director Nicole Domett and used car dealer Eugene Williams of 2 Cheap Cars, was in the process of buying three aircraft for the new services with plans to launch at the end of the year at the earliest. Two SAAB 34-seat planes would begin flights with a third to be added, but the Civil Aviation Authority must authorise an air operating certificate before KRA can launch. The Royal New Zealand Airforce Base at Whenuapai, a 20-minute drive northwest of Auckland, was once a joint military-commercial airport for almost 20 years until 1965. It was an international gateway to New Zealand before Auckland International Airport was built at Mangere. Similar joint facilities are already well-established in Blenheim according to Mr Wilson. Mr Wilson, who was convicted on four counts of fraud following the collapse of Hamilton-based Kiwi Air in 1996, said the proposal was different to previous commercial activities rejected at Whenuapai. North Harbour Business Association general manager Janine Brinsdon said of the proposal that anything enabling businesses to be more efficient was a bonus. But Upper Harbour Local Board chairman Brian Neeson labelled Mr Wilson a "dreamer" and his idea "insane". Rob O'Neil, defence editor for Pacific Wings, said Whenuapai was a busy military airbase that was already home to more than 1000 personnel along with Orion, Hercules and Boeing 757 aircraft. ...the only problem was I couldn't read the rego, though I was fairly sure what it was!!! So down to the terminal and a shot through Sunair's Aztec DGS to reveal that is Cessna 525 Conquest 1 ZK-LHL. While on a staff team building day we visited Woodlyn Park near the Waitomo Caves where we had an opportunity to get a glimpse of ex Royal New Zealand Air Force Bristol Freighter NZ5906 which was civilianised as ZK-EPC (c/n 13059, ex G-18-113). It now sees duty as a motel. The three replacement air services following the Air New Zealand withdrawal from Kaitaia, Whakatane and Westport have been announced. There has been a lot of comment written about them on this blog and as I’ve read the comments I have thought some really good points were made. So this is my commentary on what I think of the new services. But first of all… how good is current the Air New Zealand service to the three centres? Air New Zealand’s service to Whakatane to Auckland was excellent with four weekday flights to the City of Sails each day… However, if someone wanted to fly to Wellington or vice versa they had to fly via Auckland which meant a 40 minute flight on top of the flight between Wellington and Auckland with transit time in Auckland. So the question becomes whether passengers choose to fly out of Whakatane or drive the one hour to Rotorua and get a cheaper direct flight. Westport and Kaitaia have up to two twice daily weekday flights to Wellington and Auckland respectively. Unlike most other provincial services the aircraft did not overnight at either Kaitaia or Westport. This meant the flights leave for Westport after the arrival in Wellington of the first flight from Auckland and a number of other provincial cities so it is good for people heading to Westport. However, the northbound service leaves Westport too late for Buller business people to do a full day in the capital or other centres. The reverse is also true in the afternoons, the service is ideal for business people from outside of the region but not so good for the Buller business people returning home. This same pattern is operated for flights to and from Kaitaia, with flights suiting people heading for Kaitaia for the day but not so convenient for Kaitaia people heading to Auckland, Wellington and Christchurch for a day’s business. So what of the new services? Kaitaia – Great Barrier Airlines has been chosen as the new air service provider to Kaitaia. Great Barrier Airlines is no stranger to Kaitaia. In 1985 they introduced an Auckland-Kaitaia service (see http://3rdlevelnz.blogspot.co.nz/2012/01/barrier-connection-great-barrier.html) and they have for some years been operating a Whangarei-Kaitaia service for the District Health Board. GBA are going to operate a Cessna Grand Caravan on the route with 3 flights each weekday and 2 flights each way on the weekend. A Grand Caravan, in my opinion, is a good fit for the Kaitaia service. Sounds Air have proved them a stable and solid workhorse for their Cook Strait services. Being a single pilot and single engine operation will help the economics of the service and GBA have announced that they will offer a flat fare of $180 picking up the Sounds Air model of a flat reasonable fare. GBA will also be able to use the Caravan on its Great Barrier Island services which will keep its usage up and one imagines the Piper Cheiftains would also be a good substitute on the Kaitaia run if needed and certainly until the second Caravan arrives. BUT, the biggest problem I see with the GBA service is the timetable. GBA intend to base the Caravan at Auckland and that means a 6.00am flight from Auckland to Kaitaia. So, no morning connections from any centre south of Wellington and who wants to arrive in Kaitaia about 7.00am for a 9.00am meeting? I think GBA need to rethink their schedule and have the aircraft overnight at Kaitaia. It could then do a 6.30-7.00am departure to Auckland and then return to Kaitaia after the arrival of the first Air NZ/Jetstar flights from Wellington and Christchurch. Then a flight back to Auckland could leave Kaitaia about 9.30-10.00am. This would give the advantage of connecting to the cheaper post-rush hour flights to all destinations south of Auckland on either Jetstar or Air New Zealand. It could also mean the Caravan was available for maintenance or Great Barrier Island flights during the day. In the afternoon the reverse would be flown. I also wonder about the viability of a late Saturday afternoon service and early morning Sunday service unless GBA promote trips to Cape Reinga. Whakatane – Air Chathams has been chosen as the Whakatane air service provider. Whakatane is the big loser in terms of Air New Zealand’s withdrawal. It currently has four weekday flights a day. While not providing the same frequency as Air NZ the Air Chathams proposal sees an aircraft based at Whakatane and it offers weekday flights departing Whakatane at 7.15am and 4.45pm with return flights departing Auckland at 8.45am and 6.15pm. Two return services will operate on Saturdays and Sundays. Air Chathams will use either a 50-seat Convair 580 or 18-seat Metroliner on the service. Thrifty fares are offered at $89 one-way, saver fares at $149 and economy at $339. There are two questions I have about the proposal. The first is the size of the aircraft… Is the Convair too big? I know it can be substituted with a Metroliner but I wonder if it is time for Air Chats to look at getting a Saab 340 or a Embraer Brasilia. The other comment that I would make is the economy fare IS way too big! That won’t attract the numbers and in the end empty seats don’t pay! Nonetheless I think Air Chathams will be a good fit for Whakatane and I am sure Craig and team will make it work as they have already done on the Chathams service and in Tonga. Westport – Sounds Air has provided an innovative solution to Westport’s need for a new air service with its purchase of a Pilatus PC-12. Sounds Air will operate 12 return weekday flights to Wellington plus a return service on Sundays. The PC-12, which will be based at Westport, is a high performance single-engine aircraft, single-pilot aircraft. It has seating for 9 passengers and keeping with the Sounds Air formula there is a set reasonably priced air fare of $199 each way. There are a couple of questions I have about the PC-12 option that have been raised in a couple comments on earlier posts. The PC12 is going to be on the ground at Westport (Tuesday-Thursday) and weekends. As the first comment said, “To get a return on the capital cost the machine is going to have to do a lot more work than that! Not a lot of charter work at Westport!” Another commenter wrote “The problem with the PC12 and Westport is, Westport is not so much of a residential town like Blenheim. When the mines are running well, it’s far more of a mining town as in people are only there to work in the mines. Trouble is, it is international practice for these big outfits like Bathurst, Solid Energy etc not to have employees travel on single engine, single pilot aircraft. So what they're doing with this choice of plane is effectively striking off a good 60%+ of their potential customers flying in and out of Westport.” The first of these comments is certainly true and I suspect the second holds a certain amount of truth. Nonetheless I think Sounds Air have developed a good formula and they are shrewd operators so I think such factors will have been taken into account. Development West Coast (DWC) has announced it will help finance Sounds Air’s purchase of a second back-up aircraft that will be used to fly passengers between Westport and Wellington after Air New Zealand pulls its service in April. DWC chairman John Sturgeon and Sounds Air managing director Andrew Crawford signed the commercial loan agreement in Greymouth yesterday. Mr Sturgeon told The News he was unable to say how much money DWC loaned Sounds Air, or what interest it would charge because Sounds Air was a privately owned business and the details were commercially sensitive. He confirmed the finance was for a second Pilatus PC12 nine-seater aircraft that would arrive in June. Like the first PC12, which arrived from Australia in January, it was previously owned and operated by The Royal Flying Doctor Service of Australia. Last month Sounds Air confirmed the cost of the second aircraft was around $3 million, a similar cost of the first. DWC chief executive Joseph Thomas said DWC was pleased to support the Buller and the wider West Coast region with the investment. “From an economic point of view it is important to provide continuity of air service for the region. We have been impressed with Sounds Air’s track record and are keen to support the airline to make a success of the new route.” Mr Crawford said the loan arrangement was a win-win for everyone. “The support we have had from the Buller District Council (BDC) and DWC has been outstanding. To my mind the old model of an airline coming and trying to make it work is over. To operate an air service to smaller New Zealand communities takes a partnership and the BDC, DWC and Sounds Air are leading the way for what can be achieved.” Mr Crawford was currently in talks with the Grey District Council in regards to the possibility of extending its Westport service to Greymouth. Sounds Air also planned to offer charter flights and was spending about US$65,000 on medical gear, so the planes could provide emergency medical transfers. Buller District Mayor Garry Howard said DWC’s investment would help provide a more comprehensive air service from Westport with affordable airfares. “DWC is making finance available to secure an essential service for the West Coast and I believe it will benefit the whole of the Coast. “Also, the planes Sounds Air will fly are used by Australia’s flying doctors so it may give us the ability to provide medical transfers from Westport, which is a big plus for the region.” Sounds Air’s 26 flights per week service using the first aircraft is due to commence at the end of April following Air New Zealand’s last flight on April 28. Flights between Westport and Wellington will have a set price of $199 each way for adults and $179 for children, including 20kg baggage per person. Flight times will be 40 minutes, 10 minutes less than the service Air New Zealand provided. Sounds Air has committed its service between Wellington and Westport for six years and will look at extending its six-day-a-week service if there is sufficient demand. The Buller District Council has announced it will cover some of the financial shortfall of Sounds Air’s Westport-Wellington flights should passenger numbers collapse. Mayor Garry Howard told The News that council had negotiated a commercial agreement with Sounds Air that provided a “final backstop” if passenger numbers deteriorated. It became obvious to council that the key to obtaining a secure service with a user-friendly flight schedule was the provision of a limited form of security. “Without that security it was clear that the district would only get a ‘left-over’ service using old planes when those planes were not being used elsewhere.” Council would only become involved if the average occupancy dropped below three seats per flight. That was “exceptionally unlikely”, he said. The agreement stated that the income guarantee would be based on the average number of passengers Sounds Air carried. He pointed out that Air New Zealand currently flew up to 12 passengers per flight. “As Sounds Air will be flying nine-seat planes everyone hopes that they will be near to full on most flights.” Both the council and Sounds Air knew that it was not economical to operate an air service at such a low level. There was no intention that things would ever be allowed to deteriorate to that point, he said. Both parties had agreed to provide early warning conditions and provisions that allowed either party to bring the service to an end well before loadings could drop to such a low level. While the guarantee existed, it had been carefully constructed using the best legal advice to ensure that it never had to come into being. “We are very pleased to have secured New Zealand’s second-largest air service operator. They have been a pleasure to work with. The proposed schedule is a big improvement and we think that Sounds Air will only build and expand their business here over time,” he said. Yesterday we mentioned the retirement from Eagle Airways service of Beech 1900D ZK-EAK. Someone asked if there were any photos of her making a wheelsup landing at Woodbourne back in 2007. Well here is something a little more dramatic than just a photo to record the event. The "landing" took place on 18 June 2007 after the flight was diverted while flying from Timaru to Wellington as NZ2300 when a landing gear fault was discovered during the early phases of the approach to land. The full aviation safety report can be found HERE along with a great photo taken by the Marlborough Express reporter. After significant repair work ZK-EAK positioned from Woodbourne to Hamilton 09 September 2007 and re-entered service two days later. Beech 1900D ZK-EAK UE-434 was delivered to Air New Zealand Link operator Eagle Airways as N4474P arriving at Hamilton from Pago Pago on 14 June 2002. It was placed on the ZK register 5 days later. Its first flight under its new registration was on 22 June 2002 when it flew from Hamilton to Tauranga where it was placed on static display at the airport's open day before positioning back to Hamilton. On 24 June 2002 it flew a training detail from/to Hamilton via a GPS approach and overshoot at Tokoroa. The following day it made its first commercial flight carrying passengers from Hamilton to Auckland as NZ2210. In January 2012 the aircraft, along with ZK-EAG, received the All Black livery and it re-entered service on the 22nd initially positioning from Hamilton to Auckland as NZ2910 then as NZ2365 to Rotorua. Her last day of flying for Eagle Airways was on 31 December 2014 when she arrived at Hamilton from Auckland as NZ2211. A follow up to http://3rdlevelnz.blogspot.co.nz/2014/12/christmas-present-for-fly-my-sky.html, Britten-Norman Islander ZK-EVO has been busy flying between Auckland and Great Barrier Island with Fly My Sky and as such it was noted early this week sporting the operator's name and small logo on the rear fuselage. Taxiing for departure from Auckland 09 February 2015. Other blogs have featured Air New Zealand's latest Boeing 787-9 ZK-NZG... this was the first time I saw it as it was on its approach for Auckland on 7 February 2015... I do wish they would give them names!!!!! Sounds Air, which has just been lined up as a replacement airline for Westport, says it will not rule out extending its new service flying from Greymouth to Wellington. After Air New Zealand announced it would end its Westport-Wellington service on April 28, the Buller District Council courted Picton-based Sounds Air to fly the route in smaller planes. Grey District Mayor Tony Kokshoorn has written to the airline to convince them to extend that service to Greymouth. Sounds Air managing director Andrew Crawford will be in Greymouth this week to discuss the possibility. “It is great they decided to put back the service Westport to Wellington. They should extend the service to Greymouth. From a business point of view it would be a far better business plan using Greymouth and Westport as part of their service,” Mr Kokshoorn said. A number of years ago the Gloriavale Christian Community operated daily flights from Greymouth to Wellington, but it was competing against Air NZ. “We know it has worked from the past. When the Christian community had flights going the only problem was Air NZ, but you can (now) take them out of the equation.” Mr Kokshoorn said he expected there was demand to support a regular Greymouth-Wellington service again. “A huge amount of people come and go from the DHB alone.” Forty-two percent of the West Coast population lived in the Grey district – “the extra 100km (from Westport to Greymouth) just makes sense”. The Greymouth aerodrome had night lighting and was suitable for the Sounds Air plane. “We can really consolidate Sounds Air and help them make a permanent presence in Westport and Greymouth.” Mr Kokshoorn said most Greymouth people tended not to fly from Westport. “It makes sense. To get to Wellington from Greymouth you’ve got to go to Hokitika, fly to Christchurch, then fly from Christchurch. That is very expensive.” Mr Crawford told the Greymouth Star their current focus was on getting Westport set up, but he would not rule out a Greymouth option. “In fact, Greymouth will have a big part to play in this airline,” Mr Crawford said. They would have to evaluate the idea first. “You can’t just put it in and hope for the best, you have to see what the potential is and what the costs will be. There is a very real potential.” Sounds Air will fly 26 times a week between Westport and Wellington, using a modern pressurised nine-seat aircraft, a Pilatus PC12. Fares will cost $199 each way for adults, and $179 for children. Yesterday was the last day of Eagle Air Beech 1900 flights into Kerikeri and from today all Air New Zealand flights will be operated by Air Nelson Bombardier Q300s. Eagle Air commenced flying into Kerikeri on 1 November 1993 after Mount Cook Airline withdrew in favour of company stable-mate Eagle Air. The first flight was operated by Embraer Bandeirante ZK-MAS. Over the years Eagle have operated Bandeirante, Metroliner and Beech 1900 flights to the Bay of Islands. Subsequently Air Nelson started operating some services to Kerikeri alongside Eagle Air. For the last Eagle Air flights into Kerikeri over the weekend ZK-EAB did the last overnight service flying in on 7 February as NZ2674 and flying out on 8 February as NZ2661. Then later in the day ZK-EAM flew the last two Auckland-Kerikeri return flights as NZ2654/NZ2689 and NZ2662/NZ2665. Bombardier Q300 ZK-NEC as NZ8674 flew the first overnight service to Kerikeri on 8 February 2015. Air Nelson is offering four Q300 seat flights between Auckland and Kerikeri each weekday with three flights on both Saturdays and Sundays. Flights will leave Kerikeri for Auckland at 6.50am, 9.40am, 1.20pm and 5.30pm Monday to Friday, 6.50am, midday and 2.10pm on Saturdays and 6.50am, 10.10am and 4.30pm on Sundays. Flights will leave Auckland for the Bay of Islands at 8.35am, 12.15pm, 4.25pm and 6.45pm on weekdays, 10.55am, 1.05pm and 5.55pm on Saturdays and 8.50am, 3.25pm and 6.45pm on Sundays. Air Tours Kaikoura was established by the Kaikoura Aero Club in 1993 primarily as a whale watching operation using their Piper Pa28 Cherokee 180 ZK-DGM and Cessna U206G Stationair ZK-KAI. Local businessman Rodney Harmon soon took over the operation and Chris Thompson was appointed as the operations manager and chief pilot. While core business was whale watching flights, charter services, remote strip operations and supply dropping were also offered. A small office was established on the Kaikoura airfield. In 1996 Piper Pa32-260 Cherokee 6 ZK-NOW was used to inaugurate a Kaikoura to Wellington air service that operated on Fridays and Sundays. Air Direct were also offering Wellington to Kaikoura flights at this time. In 1996 Rodney Harmon took over Straits Air Charter which operated Air Marlborough. Towards the end of 1996 GAF N24A Nomad ZK-NAD was added to the Air Tours Kaikoura fleet and this was used for whale watching, on the air service between Kaikoura and Wellington as well as providing extra capacity for Air Marlborough’s service between Blenheim and Wellington. In addition to the Wellington service a connecting, on-demand service was operated between Kaikoura and Hanmer Springs using either the Cessna or Piper. On the 5th of January 1997 the Nomad was flying a charter from Blenheim to Wellington. When the crew selected the landing gear down on approach to Runway 16 at Wellington, there was no response from the system. The crew decided to return to Blenheim where they burnt off fuel to reduce the aircraft landing weight. A safe wheels-up landing was made on grass runway 07. There were no injuries. Damage was relatively minor considering and was repaired by the insurance company and returned to Air Tour Kaikoura. 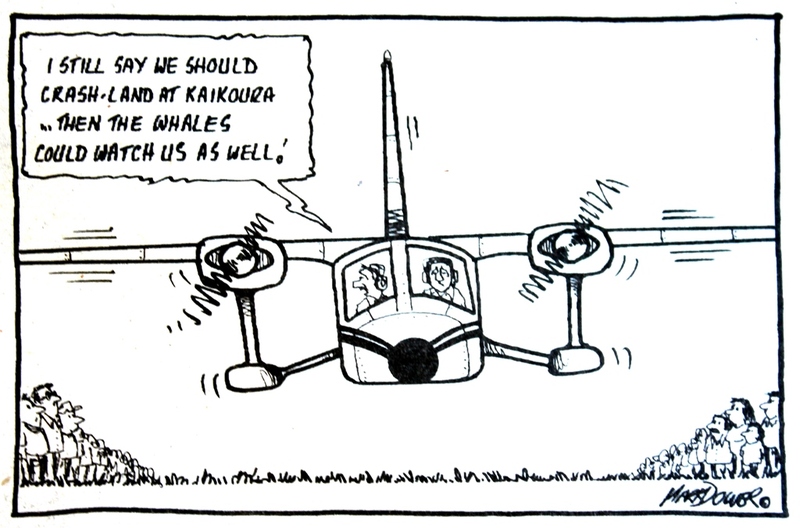 In early 1997 Whale Watch Air and Air Tours Kaikoura built a new terminal building at Kaikoura with the local District Council being the guarantor for the project. 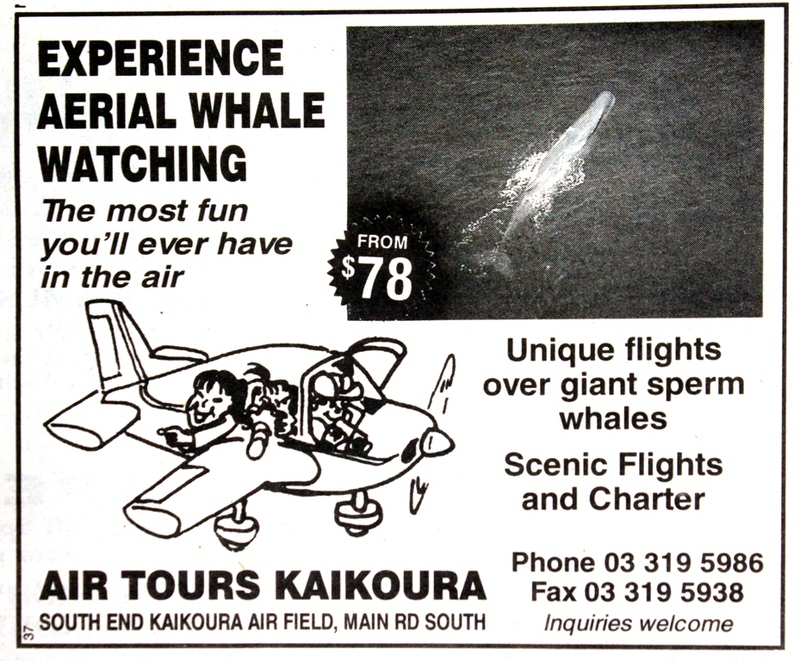 The small but modern facility was provided primarily for passengers on whale watching flights operated by Air Tours Kaikoura and Whale Watch Air but was also used for the regular air services to Christchurch and Wellington operated by Air Tours Kaikoura. In 2009 the local District Council purchased the airport terminal building. 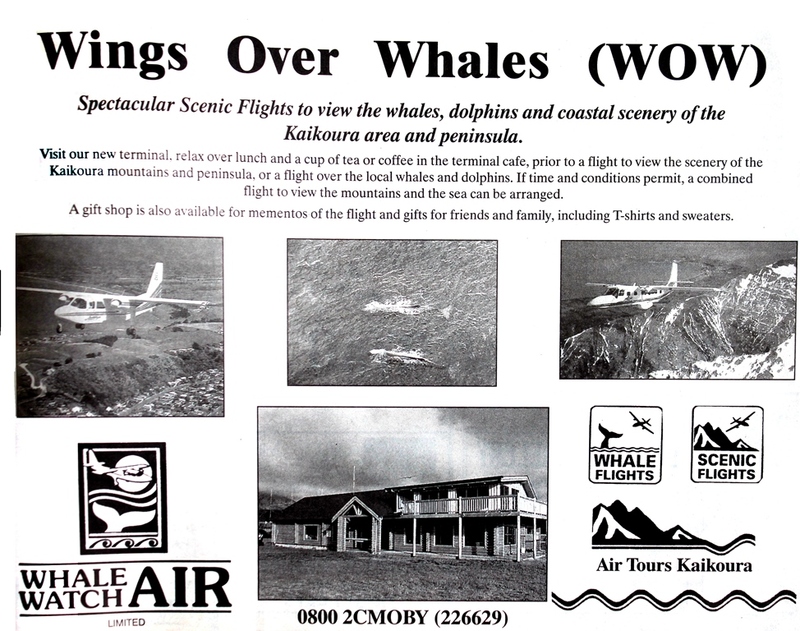 Whale Watch Air merged with Air Tours Kaikoura in December 1997 with the resultant company being named Wings Over Whales. Air Tours Kaikoura continued to operate the Kaikoura to Wellington service and the day to day operations of Air Marlborough. Cessna 172N ZK-SBJ was registered to Air Tours Kaikoura for a time in 1998. Scheduled air services ceased during 1999 with the Nomad going to Great Barrier Airlines the following year.